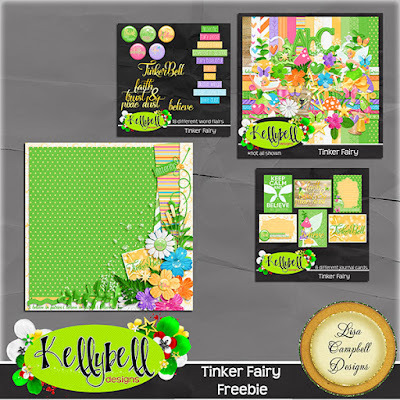 Get out your pixie dust and let’s fly to Neverland with Kelly’s magical new collection, Tinker Fairy. 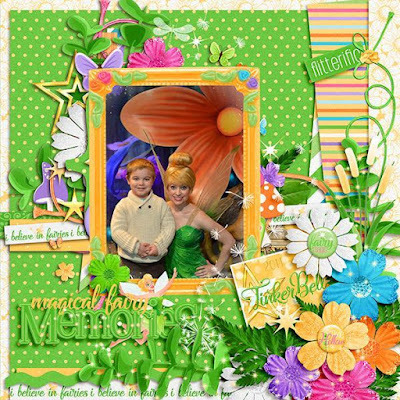 Celebrate everyone’s favorite sprite with rich luscious colors to document Tinkerbell meet and greets, visits to Pixie Hollow, parade pictures, rides on Peter Pan’s Flight, and maybe even a nighttime flight across the Magic Kingdom. Your layouts will be complete if you sprinkle in goodies from the coordinating Page Starters, Journal Cards, Word Art, Word Flair and Quick Pages. Away we go! This kit includes 15 fairy themed papers and a full green trimmed alpha set. 70 unique items include butterflies, cattails, clouds, dandelions, dragonflies, fairy dust, fly, hearts, lantern, mushrooms, ribbons, sparkles, spool, thread, stars, thimble, Tinkerbell dolls, vines, wings and much more! These new releases can be found inside the Kellybell Designs Store priced at 25% off this weekend only. You can view all the CT layouts at Kelly’s Blog or Kelly’s Facebook Page. Now how about some gorgeous freebies to coordinate with this new kit? You can find them at Linda’s Blog and mine just below. Have a great weekend and happy scrapping! Wow, this is gorgeous Lisa, thank you!!! Kelly's Toy Land Mania is released!! I am a CT member for Natalie's Place Designs, Kellybell Designs, Andrea Gold, MouseScrappers, and MHK Scraps. As a CT member I recieve product for free in return for creating and posting products.